A Postcard from CruiseCritic friends Kym and Martin. 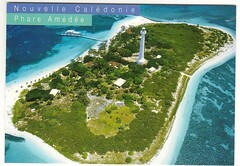 Amedee Lighthouse is built on Amedee Island, on the coral reef that surrounds most of New Caledonia. It was built in the 1860’s in France by Napoleon III and transported to the Island. It stands 56 metres tall and is the second highest lighthouse in the world.